I have been itching to plant my annuals but have held off because of the weather forecasts that have included numerous frosts over the past few weeks. Sunday morning we woke to find a light coating of snow! I could've blurted a whole bunch of expletives but I knew it wouldn't last so I kept my tongue! By mid day it was gorgeous. The sun came out and all the snow melted away. Enough of all that nonsense! 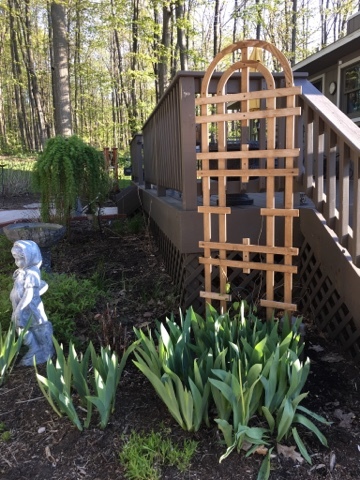 I dug out my cedar trellis that's been in storage for too long. I picked up a clematis that I hope will grow on it nicely. It's a perfect spot according to the information I read on it. They like their roots kept cool and the plant loves to be in the sun. I also planted some sweet pea seeds figuring this year the clematis won't amount to much. 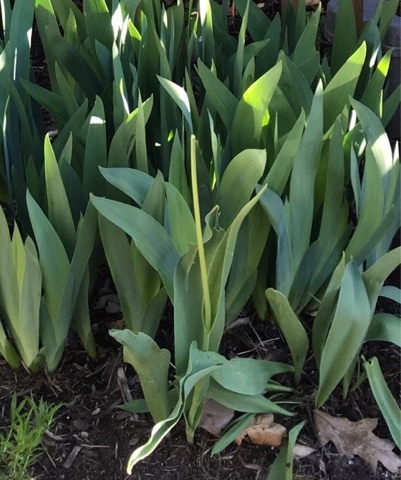 See the tulip up front? Well yesterday it had a flower but today it did not!! I'm curious what bit it off. I had Dan put the trail-cam back up to see who's visiting the yard. 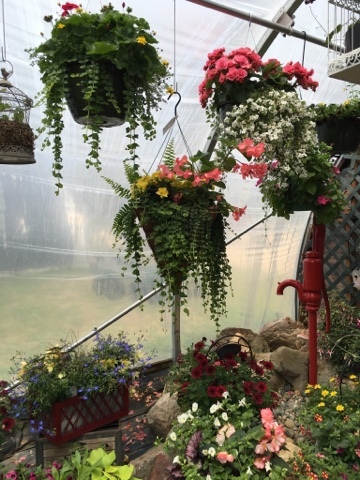 Last year I picked up two hanging baskets from this small greenhouse called Petal Pushers that I love visiting. There are 6 small greenhouses here. Some for sun, some for shade, some for vegetables, and herbs. I love these small family owned places and can't say enough about buying local. 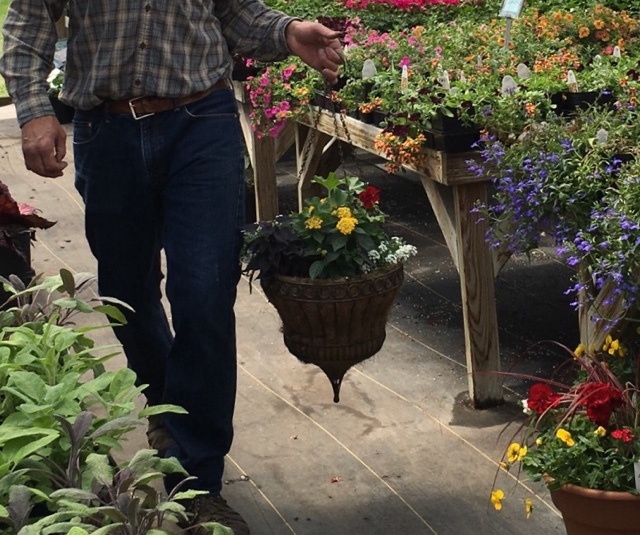 The owner and her husband have headed out to the other greenhouse to get my two hanging baskets that I had them re-plant for me. I chose to have them plant them so they could get a head start in their greenhouse and she only charged me for the plants since I bought the planters from them last year. Can't beat that deal! 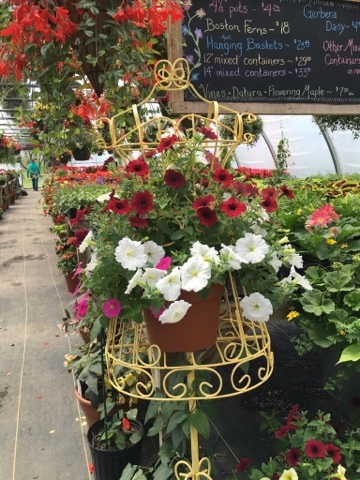 How cute is this- a metal mannequin stand with a pot of petunias! I went on line to see if I could find these but they all hit around $90 to $130. I never thought to see what she was asking for it. 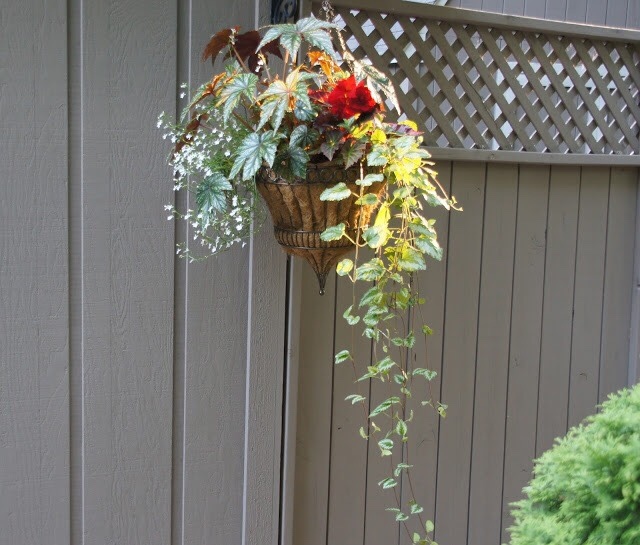 Fun planters and hanging baskets. This is Datura, Angel's Trumpet. I have never grown this but it looks so interesting. I took a few shots while waiting for them to come back. 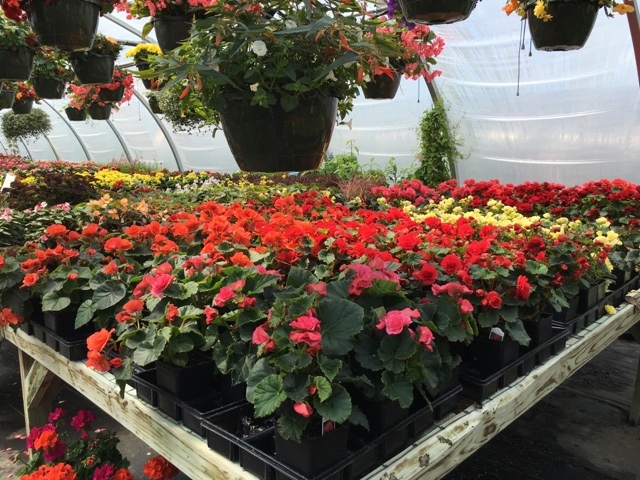 These begonias are so pretty. I went with deep red, yellow and white this year. Can't wait to see these grow! Because of their cone shape we have to support them with a bucket. I'm going to wait a little longer before trusting them to be hung up. 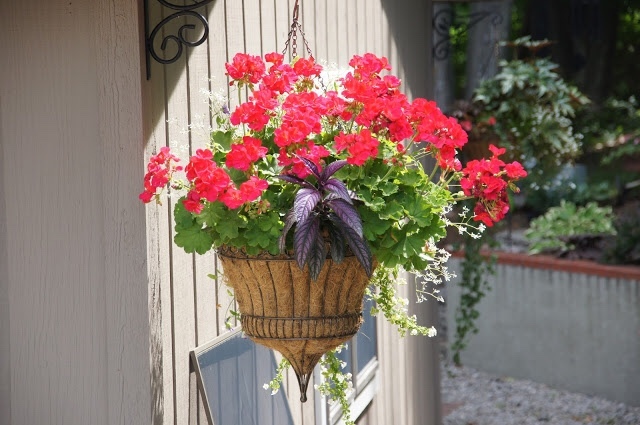 Both hanging baskets have the same color theme, same geraniums but the yellow and white flowers are a tad different because on will get more sun than the other. These are from last year. I bought them because the planters matched but the plants weren't identical. They both had a large variety of plants but this year I decided to keep it a bit simpler and generally they'll look matched. 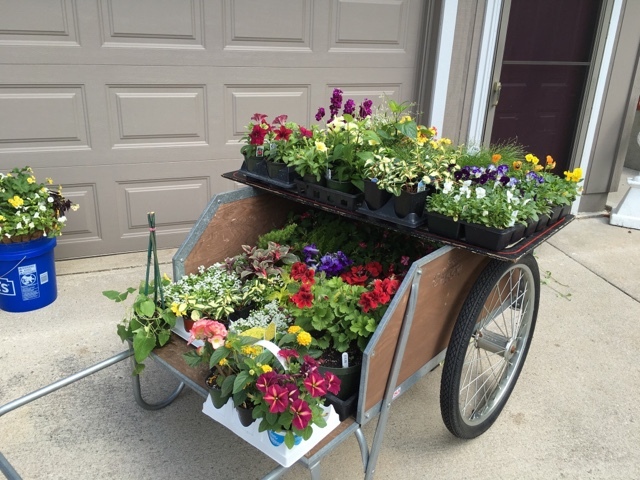 We wheel this cart in and out of the garage daily as I wait to start planting. It should be in the upper 60's by this weekend. I'm definitely planting these by then! 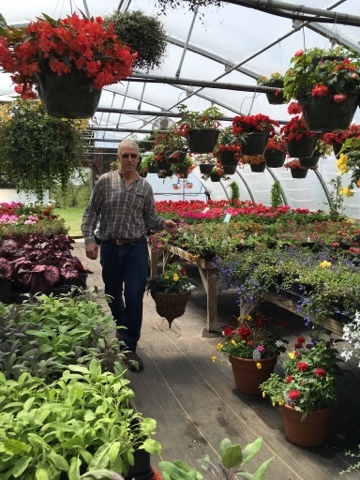 I hope your weather is great and that you are enjoying planting things! Oh it would be so very hard for me to wait this long to plant. Living in the upper south I planted a month ago....though we too have had snow in May only once. 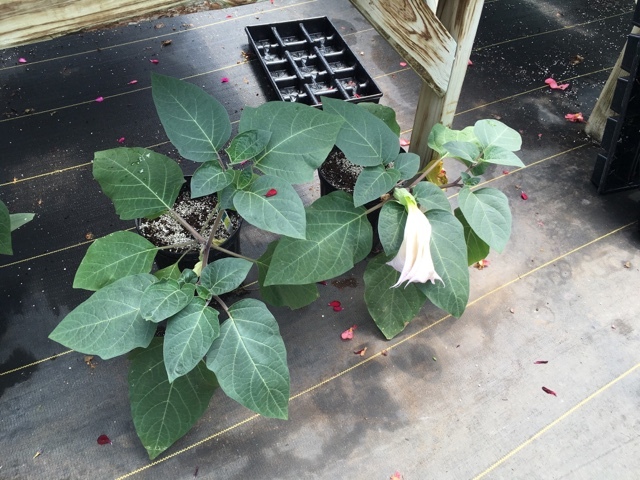 I grow Datura & love it. I got it from my mother-in-law's garden years ago. Here it grows huge & comes back every spring. 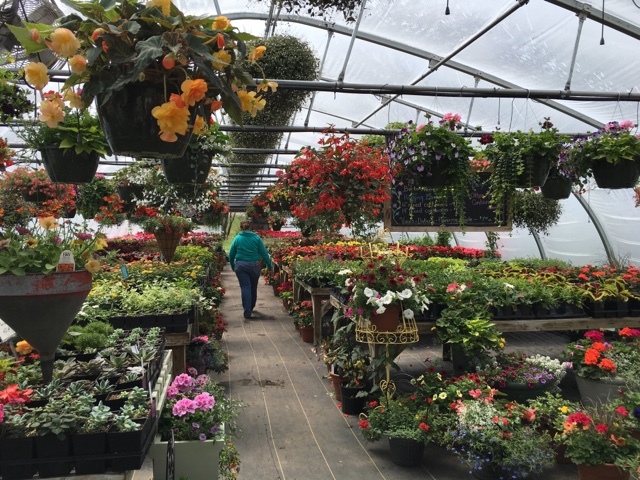 It's covered with blooms on summer nights & the blooms stay open on cloudy days as well. I have them by all my doors because the scent is so beautiful on summer evenings. 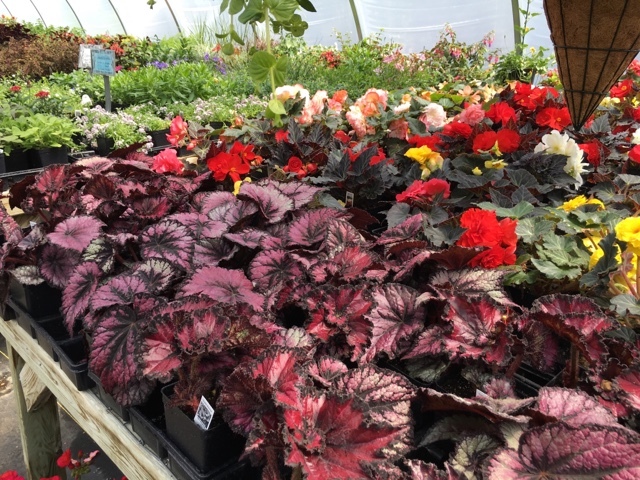 Lots of beautiful plants! Your garden will be beautiful. The baskets are lovely! Merci pour le partage de vos très jolies photos. Here, in Pennsylvania, we were teased with warm days here and there as far back as February, then cold again. My annuals are in the ground now but we have had eight days out of ten with rain. I'm hoping the sun pops out and opens all the waiting buds. I love your idea of putting your annuals in a wagon to bring out to warm. I might consider that next year. 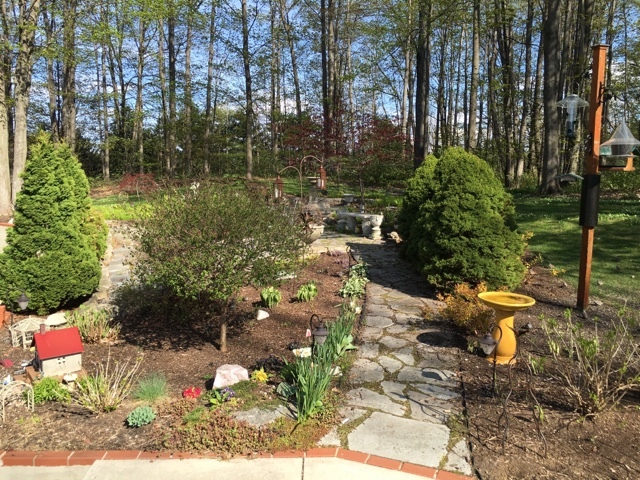 Thanks for sharing your beautiful garden and ideas! Since we're selling our home this yeat, I'm not buying many annuals, just enough to fill in the perennial beds. Beginning new gardens NEXT year. 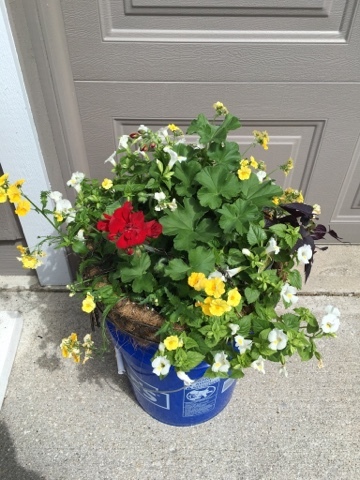 I'll be enjoying your and other online gardens this summer!